In a time of global chaos and uncertainty, this profoundly transformative book provides the inspiration many have been seeking for a return to peace, love and freedom on earth. To love and be loved, to belong, to be at peace and to make a difference in the world – these desires are at the heart of what it means to be human. But for many in today’s world, they seem so elusive. To awaken is to realise you are love and peace, you are one with all, and you can make a profound difference simply by bringing your awakened qualities into the world. Drawing from her own direct experience, Isira presents powerful insights and methods to help make this possibility a greater reality. Awakening YOU extends beyond mere concepts to provide powerful and practical tools that really work. This is a concise presentation of tried and true methods that every enlightened person knows and understands. Through a simple and interactive process you will awaken to your own innate power and discover how to create a life, and a world, of peace, love and freedom. Isira teaches that awakening does not need to be complicated, it is not restricted to a certain religion or way of life, and it is not a far off future destination. It is simple, available to all, and it can be experienced right Now. The teachings in this book point to a profound truth that is incredibly pertinent to our times: Your awakening is the catalyst for our collective awakening as a human family. Through awakening YOU, the whole world transforms with you. Awakening YOU has enriched my life! I read it from cover to cover and then have used its bounty of practices. If you only choose one practice and do it for 21 days, you will be transformed – I was! The Conscious Habits and the Breath meditations should be taught to everyone, particularly our children. 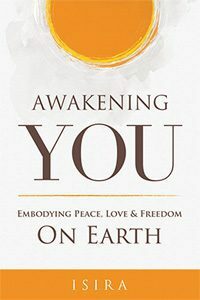 I love Isira’s book, Awakening You. It actually does contain answers to all our questions. It is a book we can pick up and turn to any page to have revealed to us a truth we so need to hear. It is a book we can read cover to cover then come back to again as we deepen to discover new insights. It is a book where parts must be re-read and the exercises practised (if awakening is our goal). Integrating what Isira teaches is fast track to freedom. I am in the deepest gratitude to Isira. Thank you Isira for your writing. I have found your books inspirational. Since reading them my path forward has become clearer, and my life has become meaningful. I now put more energy into helping others "lift the veil" on their lives. Namaste. Isira’s autobiography and memoir of her extraordinary, ordinary life.